The construction contractor has released a revised schedule for the installation of the fire suppression (sprinkler) system on the 2nd floor. Work will begin this Monday (Sept. 29) in the northeast quadrant of the floor, after having been originally scheduled to start a little more than a week ago. 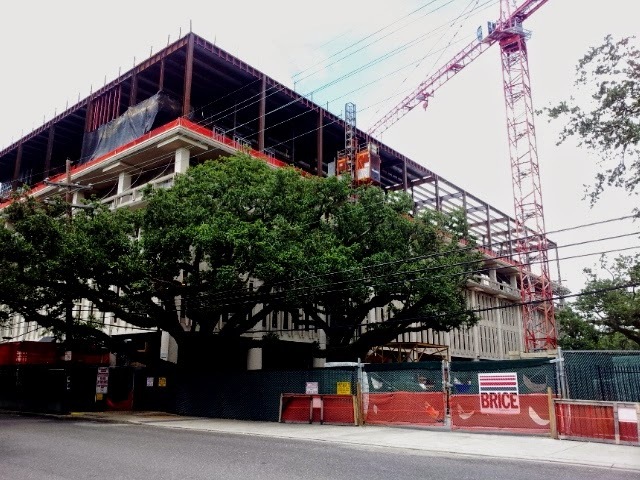 The delay in progressing from the 3rd floor to the 2nd was requested by Tulane’s project managers to make sure the installation work on the 3rd floor had been adequately completed in detail, including inspections and pressure tests of the installed system. 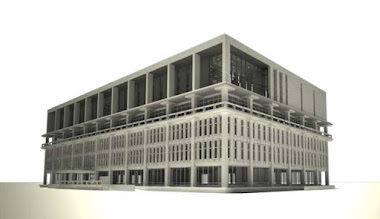 The installation work on the 2nd floor will be done in phases that will progress counterclockwise in sequence. 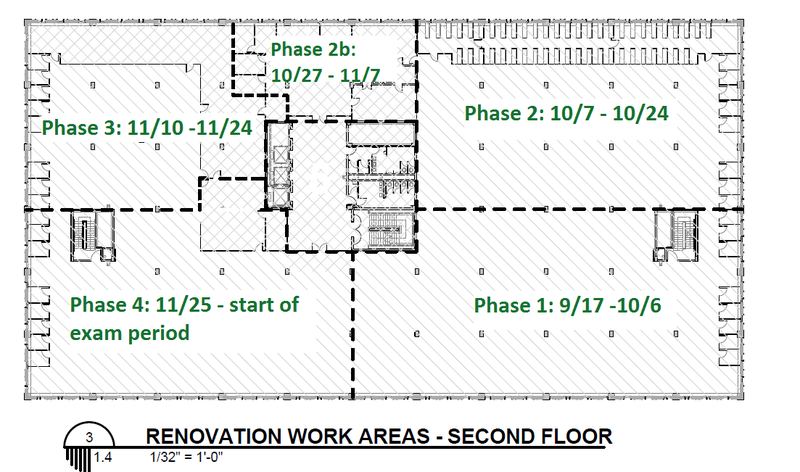 The phased work zones on the 2nd floor are laid out so that none of its separately staffed areas (the Library Admin Office, Microforms & Newspapers, and Interlibrary Loan) are located in the same zone, and each of the zones with staffed areas comes later in the sequence. Arrangements will be made where needed to temporarily relocate staff, as well as sensitive equipment, and to otherwise cover furniture in affected areas while the work is being done in each phase, as was done on floors 3 and 4. 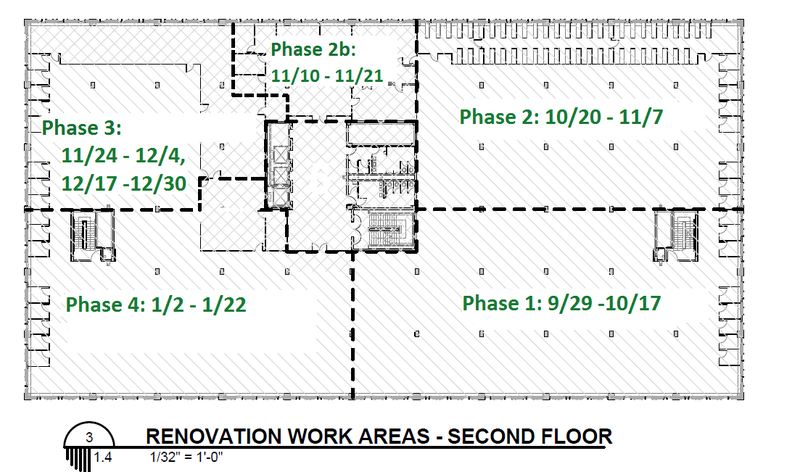 To the right is a floor plan showing the revised 2nd floor phasing schedule. As planned, crews are getting set to begin the installation of the fire suppression (sprinkler) system on the 2nd floor this week. They plan to wrap up the installation project on the 3rd floor today and tomorrow. The phasing schedule for the 2nd floor has the work starting in the northeast quadrant of the floor before circling around, in sequence, counterclockwise. The phased work zones laid out for the floor are drawn so that none of the separately staffed areas on the floor (the Library Admin Office, Microforms & Newspapers, and Interlibrary Loan) are located in the same zone, and each of their zones comes later in the sequence. Arrangements will be made where needed to temporarily relocate staff, as well as sensitive equipment, and to otherwise cover furniture in affected areas while the work is being done in each phase, as was done on floors 3 and 4. The floor plan to the right shows the phasing schedule. Work in the first phase on the 2nd floor is expected to officially begin this Wednesday, Sept, 17. 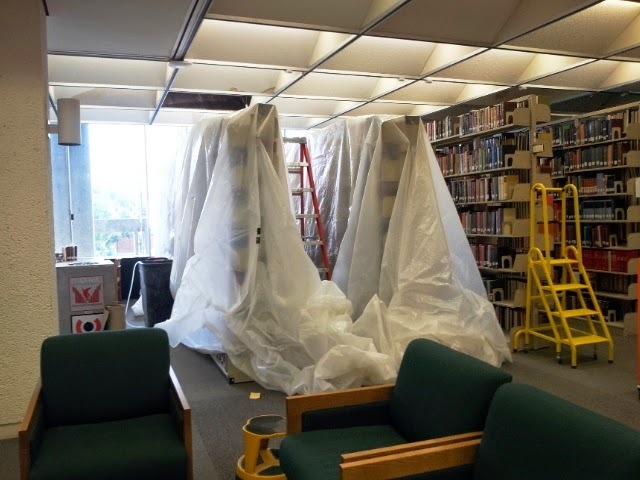 Workers could arrive in the area tomorrow to begin their prep work, which may include starting to cover book ranges in the northeast quadrant of the floor with plastic sheeting. If for any reason it looks like too much work remains in finishing the 3rd floor tomorrow afternoon, the progression to the 2nd floor might be delayed a day or so. However, work on the 3rd floor has been steadily progressing on schedule for the past several weeks. With the steel frame and new roof for the library's two-floor addition only partially complete, the potential for occasional roof leaks has increased along with the huge amount of construction activity now on the present roof top, in addition to the extra weight from a large amount of mechanical equipment and materials stored up there. One relatively minor water roof leak, following some very heavy rainfall outside, was reported and addressed Saturday above the ceiling in the northeast corner of the 4th floor. The leak produced water dripping in three places: two over the book stacks and one in a corner office. No books were damaged. Plastic was placed over the books in the immediate area and large a dehumidifier was brought in to keep the area and its books dry. Workers will continue to address the source of the problem both above the ceiling and on top of the roof throughout the coming week. Library users should feel free report problems like water dripping from the ceiling or other building issues at the the library's main desk on the 1st floor. This can be especially helpful on evenings and weekends when there are fewer library staff members in the building to watch for problems. Meanwhile, as more of the frame and sides of the two-floor addition are completed over the next several weeks, the potential for roof leaks should lessen at an equal rate.